A recent article in The New York Times, “Car Free Vacations for the Urban Traveler,” spotlighted major transit improvements in Denver, Detroit, Los Angeles, and Phoenix. (All of these cities, except Detroit, have been featured in previous Car Free Journey columns.). Here is the link: https://www.nytimes.com/2017/02/20/travel/car-free-vacations-in-american-cities.html?smprod=nytcore-iphone&smid=nytcore-iphone-share. In March and April, 2013, guest columnists Johnny Elbow and Karen Ptacek, from (Dallas Area Rapid Transit) Marketing & Communications (DART), wrote a two-part series describing how visitors could enjoy visiting Dallas without needing to drive. However, much has changed since 2013. To help our readers, the DART Marketing & Communications staff has contributed an updated Car Free Journey column that includes descriptions of neighborhoods, places to stay, and other important information for anyone considering visiting Dallas without a car. 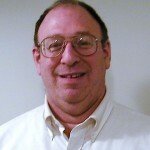 Part 1 includes DART’s updated column. Part 2 (next month) will include information about Dallas local parks, and tips and suggestions from local residents about their favorite activities, places to go, and where to eat. Gone are the days when the automobile was practically Dallas’ mascot and a visit here meant taking taxis or renting a car. Whether you’re in Dallas for business or visiting as a weekend getaway, much of Big D is surprisingly transit-accessible and pedestrian-friendly. Both Dallas/Fort Worth International Airport and Dallas Love Field are connected to downtown Dallas by public transit, and Amtrak, Megabus and Greyhound all have downtown terminals. Many of DART’s rail stations and bus transit centers offer free parking; find a complete list at www.DART.org/parking. Passengers arriving at DFW Airport can take the DART Rail Orange Line from DFW Airport Station, located at DFW Airport’s Terminal A, near the lower level of Gate A-10. The Orange Line operates seven days a week; trains arrive at DFW Airport regularly from 3:50 a.m. to 1:19 a.m. daily. The Dallas Greyhound Station is on Lamar Street, approximately three blocks from DART’s West End Station. There is a lot of great artwork located in the lobby area of this high-end boutique style hotel. Not surprisingly, the best place to stay is in the heart of downtown Dallas, which is served by all four light DART rail lines, (Red, Blue, Green, and Orange) and the Trinity Railway Express, DART’s commuter rail line co-owned by the Fort Worth Transportation Authority (FWTA). Every hotel in downtown Dallas is within a few blocks from a DART station, and the sleek trains arrive every few minutes to whisk you to the city’s most popular dining, shopping and entertainment destinations. And here’s the best part; you can ride just about anywhere DART goes – all day long – for as little as $5. Plus, you can buy transit passes and access trip planning tools with the agency’s free GoPassSM app, available in the App Store and Google Play store. Save money with a DART pass for unlimited travel on local buses and light rail. A one-day pass costs $5, a regional pass is $10, and a reduced fare pass is $2.50. For details, and other information about fares and passes, go to http://www.dart.org/fares/fares.asp. During your visit, you can explore Dallas either by your individual interests, or by visiting neighborhoods and enjoying attractions, restaurants, and other highlights of each neighborhood. DART now offers 93 miles of light rail service reaching 64 stations, complimented by a vast network of buses, operating seven days a week, plus commuter rail connections to Fort Worth and Denton. You can access online trip planning and much more information at DART.org or 214-979-1111, or use the transit option on Google Maps. Many districts worth exploring are located in or near downtown Dallas. All stations listed are part of the DART System. After each neighborhood, we will list which rail line(s) serve those stations. Main Street, located 2-3 blocks from the downtown DART Rail stations, is the city’s bustling corridor of restaurants and nightlife. Shopping doesn’t get any more stylish than at the landmark original location of Neiman Marcus and its Zodiac Room restaurant. Need a breather? Pegasus Plaza and Main Street Garden are popular gathering place for live music and festivals. Look for the bright magenta-and-yellow D-Link buses: your free link to arts, fun culture and dining. D-Link operates on a bi-directional route between the Kay Bailey Hutchison Dallas Convention Center and Uptown, with stops at the Dallas Farmers Market and other destinations. Buses run every 15 minutes, 11 a.m.-11:30 p.m., Monday-Saturday. Head the opposite way from the Akard Station down Field Street a half mile, and you’ll arrive at the Perot Museum of Nature and Science, filled with hands-on learning experiences, interactive digital displays and lifelike simulations of the natural world. http://www.perotmuseum.org/. The Dallas Center for Architecture offers 90-minute guided walking tours of the Dallas Arts, Main Street, and West End districts that examine the city’s signature and historic buildings from the 1890’s to the present day. For details, go to http://dallascfa.com/register-for-a-public-tour.html. The Dallas Arts District is a unique 68-acre, 19-block neighborhood that is the centerpiece of the region’s cultural life and home to some of the finest architecture in the world. The AT&T Performing Arts Center’s impressive venues – Winspear Opera House, Wyly Theatre, Annette Strauss Artist Square, Dallas City Performance Hall and Sammons Park – join a thriving collection of cultural landmarks, including the Dallas Museum of Art, Meyerson Symphony Center, Nasher Sculpture Center and Crow Collection of Asian Art. Klyde Warren Park creates an urban oasis at the district’s outer edge and connects pedestrians to the Uptown District. The Dallas Arts District also is home to lots of restaurants and bistros, many located at One Arts Plaza. Dallas West End. 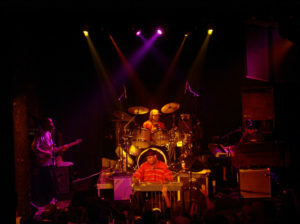 Photo courtesy DCVB. 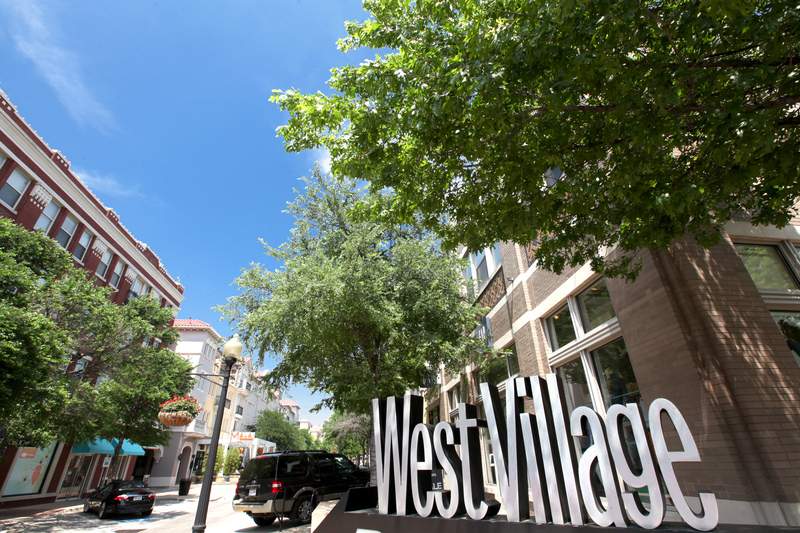 The West End – a historic district of red-brick warehouses – offers a variety of cuisine, from Texas-style barbeque at Sonny Bryan’s to fine dining at The Palm. You can shop for unique gifts and Texas fashions at Wild Bill’s Western Store: (http://wildbillswestern.com/), take in the marine life and natural rainforest exhibits at the Dallas World Aquarium, learn about tolerance at the Dallas Holocaust Museum or get a taste of local history at the Old Red Museum of Dallas County History and Culture, which is located inside the county’s landmark 1892 courthouse. Of course, few make a visit to the West End (or Dallas, for that matter) without stopping at the Sixth Floor Museum at Dealey Plaza where JFK was shot and, nearby, the infamous grassy knoll. Dallas’ Deep Ellum neighborhood dates back to the late 1800s and gets its name from the pronunciation of Elm Street favored by early residents. Over the years, the brick structures have been home to businesses as diverse as the people who frequent them: dance halls,restaurants, bars, live music venues, meat markets, pawn shops, art galleries and the Latino Cultural Center. At DART’s Deep Ellum Station, “The Traveling Man” welcomes visitors in the form of a three-part sculpture installation including “Walking Tall,” a jovial, 38-foot-tall man strolling down the street. Bursting with historic charm, this popular North Oak Cliff neighborhood – now accessible by the Dallas Streetcar – is home to over 60 independent boutiques, restaurants, bars, coffee shops, theaters and art galleries housed in quaint 1920s-era buildings. 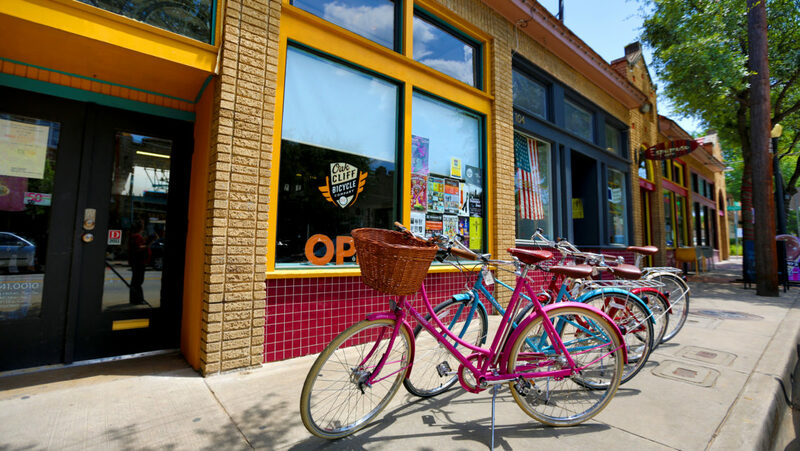 While many of the shops stay open late on the weekends to provide a fun shop, stroll, and eat environment for visitors, the Bishop Arts District is made up of many independently-owned shops and eateries that maintain various hours. Bishop Arts Route 723, which requires a DART local fare, meets each Dallas Streetcar at the Bishop Arts stop, every 20 minutes, 9:40 a.m. to 11:40 p.m., seven days a week. It operates in a counter-clockwise loop through the Bishop Arts and Jefferson Boulevard districts. The Cedars has been turned into a cultural hotspot thanks to the transformation of the old Sears warehouse into the South Side on Lamar residential/retail/gallery complex. 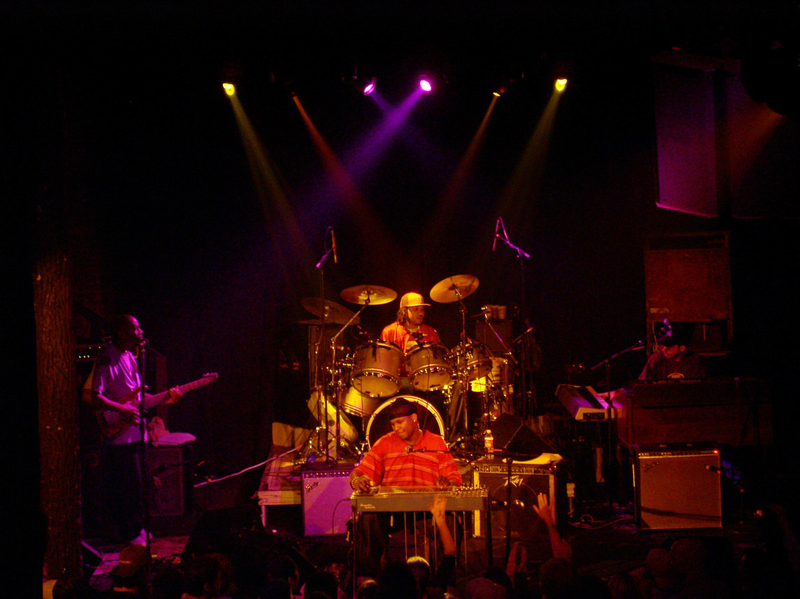 From Cedars Station, you’re just blocks from great food and live music – including the South Side Ballroom, the Dallas reincarnation of Gilley’s world-famous honky tonk, the eclectic Lee Harvey’s, and the singer/songwriters of Poor David’s Pub. Nearby, the Alamo Drafthouse Cinema is a haven for film enthusiasts where higher-end craft beer, house-made cocktails and delicious food make for a fully integrated evening. Uptown (M-Line Trolley) Uptown, just north of downtown, is one of Dallas’ oldest neighborhoods transformed with a vibrant street-level mix of restaurants, bars, cafés, retail shops, galleries, antique dealers and live theatre. One such destination is Theatre Three, one of Dallas’ best-known and longest-running community theatres. 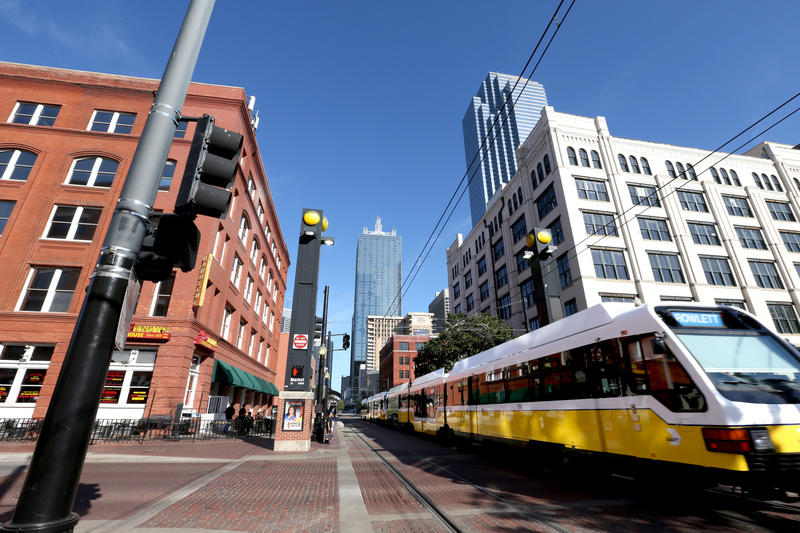 Tying the uptown area to downtown is the vintage (and free to ride) M-Line Trolley, running from near St. Paul Station in downtown, through the Dallas Arts District, Uptown, McKinney Avenue and West Village to the west entrance of Cityplace/Uptown Station. West Village (Cityplace/Uptown Station) – Red, Blue, and Orange Lines Located three blocks west of Cityplace Station – DART’s only underground stop – Uptown’s West Village is home to an eclectic mix of boutiques as well as established retailers. 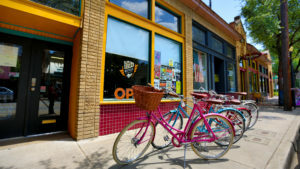 Along with the upscale shopping options you will find one-of-a-kind restaurants, bars and cafes. While at West Village be sure to catch a flick at The Magnolia Theatre film art house. Want a textbook example of transit-oriented living? Check out Mockingbird Station: a high-density development adjacent to its namesake light rail station. This modern shopping center features boutique and name-brand shopping, dining options, a comedy club and a multi-screen independent film theater. From the upper level of DART’s Mockingbird Station, catch the Route 743 Museum Express to the campus of Southern Methodist University, home to the George W. Bush Presidential Center and the Meadows Museum of Art. Dallas is known for its shopping and NorthPark Center is one of the city’s best examples. A convenient shuttle (DART Route 702 NorthPark Center Shuttle) to and from Park Lane Station lets you explore its more than 235 retailers for yourself. Named as one of the “7 Retail Wonders of the Modern World” by Shopping Centers Today, anchors include Neiman Marcus, Nordstrom, Macy’s and Dillard’s. To top off a full day of fun, catch a flick at the mall’s 15-screen AMC movie theatre. Across the street from the station, The Shops at Park Lane pairs the best in stylish shopping with distinctive dining and entertainment options, including Nordstrom Rack, Bloomingdale’s Outlet and Saks Fifth Avenue OFF 5th, as well as Grimaldi’s Pizzeria, a Gordon Biersch high-end brewery bistro, and the largest Whole Foods Market in North Texas. There are always exciting things to see and do at the Southwest’s oldest and Texas’ largest zoological park. The 95-acre Dallas Zoo is known for The Wilds of Africa – a 20-minute monorail tour through six African habitats – as well as the Lacerta Family Children’s Zoo, the Jake L. Harmon Gorilla Conservation Research Center and Giants of the Savanna, which takes you on a safari adventure complete with giraffes, lions, elephants, cheetahs and other African species. Wild, huh? If you have time, consider taking the Trinity Railway Express to the nearby city of Fort Worth. Fort Worth’s Cultural, Stockyards and Sundance Square districts are accessible by taking the Trinity Railway Express, a commuter rail line connecting downtown Dallas to downtown Fort Worth. Scheduled train service is provided Monday through Saturday. No service is available on Sunday. Evening service is limited, so be sure to check schedules before traveling. Once in Fort Worth, FWTA’s buses can transport you from the TRE’s Intermodal Transit Center (ITC) Station to your destination. Unfortunately, several popular destinations can only be reached by car or cab. In Part 2 of this series, we will share tips and suggestions from local residents to help you enjoy Dallas even more during your visit. We will also explore several of Dallas’ city parks. Go to www.DART.org, or call: 214-979-1111, Monday-Friday: 6 a.m.– 8 p.m. Saturday, Sunday, and Holidays: 8 a.m.– 5 p.m.